The Goboist: BEFORE THERE WAS PHOTOSHOP—WE DID IT IN-CAMERA! BEFORE THERE WAS PHOTOSHOP—WE DID IT IN-CAMERA! Competition was fierce in the slides division in my local affiliate (camera club) of PSA; the Photographic Society of America. Every month I had to come up with something artistically compelling with great impact; something the judges had not seen before. The slides division was challenging because I had to compete with an image straight out of the camera—no darkroom magic with the printing process—and, with no Photoshop then (1979), any magic had to be done “in-camera”. So, this particular month I decided to see if I could execute the image I had in my head of the Rosicrucian Egyptian Museum at night. This Egyptian museum, in San Jose, California, has the largest collection of authentic ancient Egyptian artifacts in the Western hemisphere. The main entrance is a Karnac inspired building with a portico of pillars that surrounds an opening view of the sky. The lighting of the pillars made this attraction far more dramatic at night than during the day. The image I had in my head was a wide angle view straight-up looking through the opening to a black sky with the moon on one side—Like this…. Captured: May 1979, Film: Kodak Ektachrome 64T (Tungsten). Base image: 1-second @ f8.0 with 16mm fisheye lens. - Moon image: 200mm lens f2.8 for 1 second. Even 36 years later I still really like this image, mostly because it’s one of the few times I created an image that exceeded my goal! The unexpected surprise was the complex lens refractory flares caused by the overhead flood lights. Some judges didn’t like them, but I think they add to the space theme I was going for. Kind of a 2001 or Star Wars Space dock look. Back then lens flare was frowned upon as a professional—these days it’s all the rage—I guess I was ahead of my time! Because I had no idea when, if ever, the moon would appear within this opening, I knew I would have to do a double exposure to bring the moon into the pillared aperture. But first, I had to capture my base image of this Karnac inspired temple. I did a proof of concept test one evening to establish basic exposure and focal length needed. Using a Canon 24mm lens on my Canon F1, I found out that the 24mm was no where near wide enough to capture the pillars around the opening— even when laying on my back! I did get the exposure data and came back for another test with a 16mm fish-eye on my Minolta SRT 102. 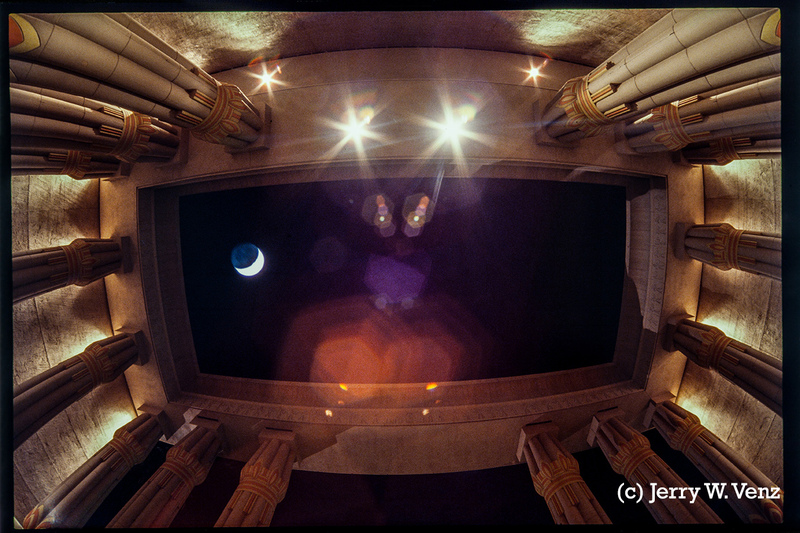 It looked great through the viewfinder, laying on my back, but I decided in order to capture the widest possible view of this temple to simply place the camera on the cement floor set the timer and high-tail it out of there before the shutter tripped! Since the moon was ideal that week—I did not want a full moon—I decided to use this roll of images for the in camera composite. So, for those of you who have never done this, all you have to do with your 35mm camera (a manual camera) is rewind the film and when you feel the film leader come off the camera’s spool—stop cranking the rewind handle. You DON'T want to rewind your leader INTO the film canister. Then you open the camera back and simply reload the film exactly as it was—using the crease in the leader as your guide. The final step was to go out the next night and photograph a roll of moons to get my double exposure. Doing this on a tripod—since my film was only 64 ASA—I decided to change the lens to a 200mm to make the moon larger within the frame. The other action I did to give me choices was to photograph the moon in many different places within the frame—I mostly either placed the moon to the left or right of center—and crossed my fingers! That was all there was to it! And I got the image, actually several good images, with just this one 36 exposure roll of film…totally blind…no back of the camera preview…no RAW…no Photoshop! Don’t hesitate to make any comments or ask questions. ’Till next week….